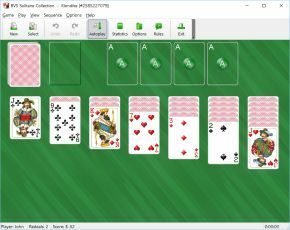 Klondike Solitaire, or simply Solitaire, is the classic solitaire game. 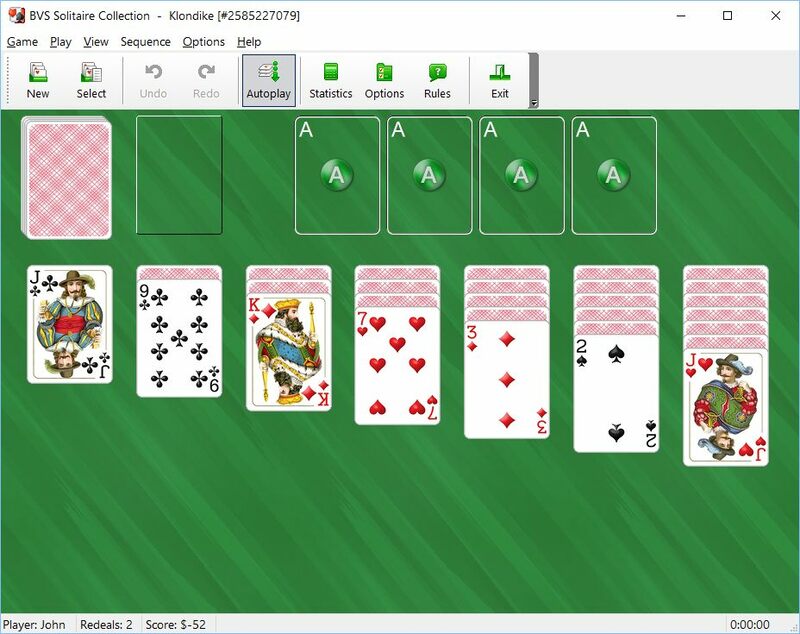 Klondike is probably the best known solitaire game in the world. The rules of this game are known to almost everyone. Not all games of Klondike Solitaire are solvable. Playing Klondike game involves a lot of guesswork and it is the main reason why you do not win the vast majority of the games. This article covers some strategy tips that that could be helpful for improving your win/loss ratio. Turn up the first card off the deck before making any other moves. It increases the initial number of possible moves and gives you the opportunity to make a better choice. Always move an Ace or Deuce to the foundation whenever it is possible. This rule seems to be clear and logical and does not need any further explanation. Expose hidden cards. If you have a choice from several possible moves that expose hidden cards, choose column with the largest number of hidden cards. Hold off the moves that are not important. The best move is one that provides you with opportunity to make other moves or expose hidden cards. Do not empty a tableau pile if you do not have a King to put it in. You gain nothing if you get an empty pile. A space in Klondike solitaire can only be filled by a King or a sequence starting with a King, so leave your options open. If you have a choice between a black King and a red King to fill a space with, be cautious in your decision. Look at the color of the blocking cards and make the appropriate color choice. For example, if you have a red Jack that blocks some hidden cards, you have to select a red King and than wait for a black Queen. There are two basic ways to deal cards from the stock in this game: player deals either the cards at a time, or only one card is dealt at a time. The recommendations given above are applicable to both variations. The only difference for the "deal three at a time" variation is that you have to pay close attention to the order of the cards in the order of cards in the deck. Some people suggest dealing all the cards to the waste pile once without making any moves and remember the order of the cards in the deck. If you play computerized version of Klondike, you can use the unlimited undo function as many times as you want to try different choices and to maximize your chances of winning.